Home » Linen, Facilities, and Uniform Services Blog » Uniform Services » How Does Uniform Rental Work for Your Business? How Does Uniform Rental Work for Your Business? 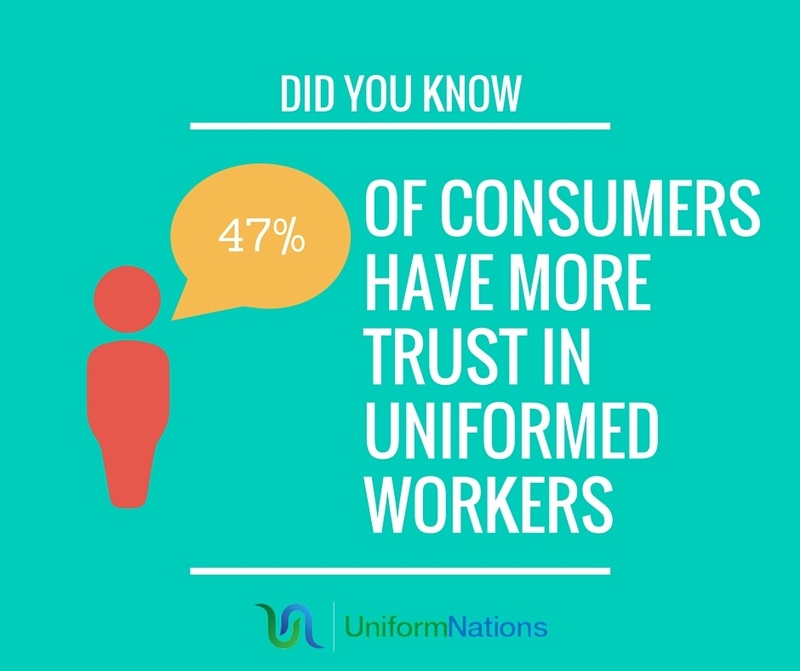 Did you know that 47% of consumers have more trust in uniformed workers? Uniforms represent your business. With the right uniform you can set your business apart from the competition. We provide you with a free quote from a uniform rental service provider to match you with all of your uniform needs. A customized uniform and workplace supplies program can help you retain customers, earn new business, and generate more revenue. An employer’s number one concern should always be for the safety of their employees. Some industries are more hazardous than others. That is why different industries have different uniform requirements. Uniforms can help protect your employees in dangerous environments. A uniform can create a sense of community. A uniform brings a feeling of equality and belonging to the workforce. This can create feelings of kinship and loyalty, which is sometimes hard to achieve, ultimately boosting morale. A uniform can increase productivity because it saves the employee time and money. The employee does not have to choose what to wear every day or worry about what they are wearing. The employee can simply focus on the task at hand with 100% focus. There are certain service industries that revolve around the need of the customer. For instance, restaurants, hospitality and department stores. These industries demand that the customer is able to pick out who an employee of the facility is. When the workforce is wearing a uniform the customers are aware of who they can ask for help and who can help with customer service. With uniform rental you leave the details to the professionals. A fully-managed rental program delivers clean, professional uniforms and workplace supplies to your business every week. You and your employees no longer have to worry about laundering, mending, or replacing work clothes. With uniform rental, we outfit your staff based on a thorough review of your needs and give you a wide selection of products to choose from. Sales representatives schedule weekly delivery and pick up of professionally-laundered apparel and workplace supplies. As your staff size increases or decreases you are provided garment size changes, inventory updates and replace name tags. Your dedicated account team will ensure fast turnaround times and responsive service so your business runs smoothly and efficiently. Customize uniforms to best fit your style and needs. Your team will be outfitted to make sure the uniforms fit correctly and comfortably. Once uniforms have been picked and fitted a week supply of uniforms will be delivered to your facility. Each garment is labeled with a heat seal ID label with the Employee’s name, size, and date garment went into service. Once a week’s supply of uniforms have been used a truck will swing by to pick up the articles of clothing and supplies that need to be laundered. They will also drop off a fresh week supply of uniforms. Each week the dirty garments are hand counted and itemized on your invoice to ensure the proper number of garments are returned the following week. The dirty garments are taken to our facilities where they are laundered. Uniforms are repaired and replaced as they start to wear at no additional cost. The mended and clean uniforms are delivered directly to your business and the process starts over. Uniform Nations is your source for quality uniform and linen services. We offer Uniform Services, Linen Services, and Facility Services from experts throughout the United States to serve your needs. our experts will help you select a customized service that fits exactly what you’re looking to do for your company. Uniforms and linen services are a huge part of running a successful business. It’s important to make sure that you get exactly what you are looking for in order to maintain the image that your company is going for. To get a free quote request, fill out the form to the right, or give us a call at (866) 467-4178. Within minutes of receiving your request, you will have free quotes from uniform, linen, or facility services professionals in your area that can help you with your project.